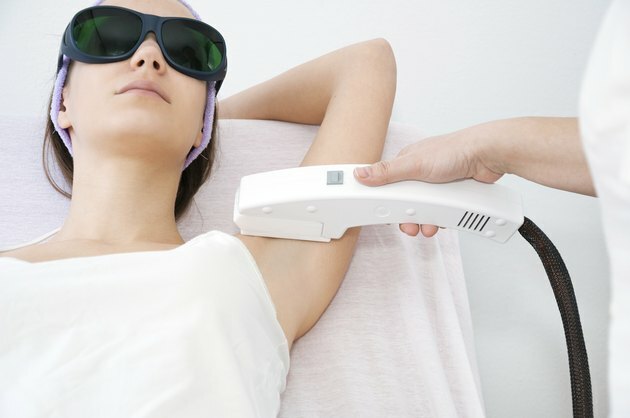 Laser hair removal is an ideal way to get long-lasting hair removal results. Laser light is aimed at individual hair follicles, sending them into a resting phase, which limits hair growth. Post-procedural instructions include treatment for red, swollen bumps that are a normal result of this procedure. The skin may be irritated and swollen for the first couple of days after laser hair removal, and proper skin care is required to make the healing process successful. Apply a cold compress to the treatment area three to four times daily for up to 15 minutes per application. This soothes irritated bumps and helps combat swelling and redness in the skin. Ice can be wrapped in a clean cloth, or use ice packs. Apply a thin film of steroid cream to the treatment area as directed by your dermatologist. Topical steroid creams will lessen inflammation and ease pain and discomfort from laser bumps. These creams also speed the healing process. They are prescribed during your first laser hair removal treatment. Cleanse the treated skin twice daily with a gentle cleanser and soft washcloth. Avoid scrubbing the area, which can lead to further irritation. Gentle cleaning will help promote skin healing and prevent bacteria from entering the treatment site and causing bumps to become infected. Lukewarm or cool water during cleansing will provide additional soothing relief to these painful bumps. Cover the treatment area with clothing for the first week after treatment to avoid sun exposure. Exposure to the sun during this time can worsen bumps and cause further skin irritation. After a week, wear sunscreen when going outdoors instead of fully covering the skin.